As much as a Rat's Tail: Korean slang, invective & euphemism- the "Insider's guide"
Get 'street' with A Rat's Tail - Learn what the kids are really saying, all the Korean they will never teach you in class. Korean is rich with the dynamic linguistic expressions and freshly coined language. 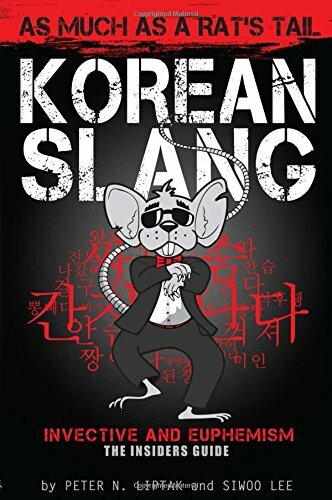 A Rat's Tail dives into the intricacies of modern Korean slang introducing the hip, hot, spicy and sexual, the irreverent and inspiring, the cultural, crass and comical. This is the Korean not covered in the language books, full of color and infused with philosophy. With A Rat's Tail in hand, you can impress others with your verbal acumen as you complement their fashion sense, dish out dirty words, or text up a storm, while you gain insight into the mind and culture of the Korean people. Get the Straight Scoop with explanations of uncommon words and unusual usage. Culturally Speaking - get the skinny on how Koreans think, speak or act. Plus how to pick up, break up, make up, or get down and dirty. Find out who's abusing you and how to talk about someone behind their back. Peter N. Liptak lives and writes in Seoul, Korea. An avid traveler and poet, Peter draws on Korea's people, language and culture as a source of inspiration, linguistic and otherwise. Keen on dialect and borrowed words in language, Peter did his MA in Korean Studies at Yonsei University. Siwoo Lee - A young philosopher who studied international management at KyungHee University, Siwoo has taken a profound interest in the symbolism of language, combined with his fascination with foreign tongues and his sophisticated command of slang, has led him to delve into the world of A Rat's Tail. If you have any questions about this product by Exile Press, contact us by completing and submitting the form below. If you are looking for a specif part number, please include it with your message.